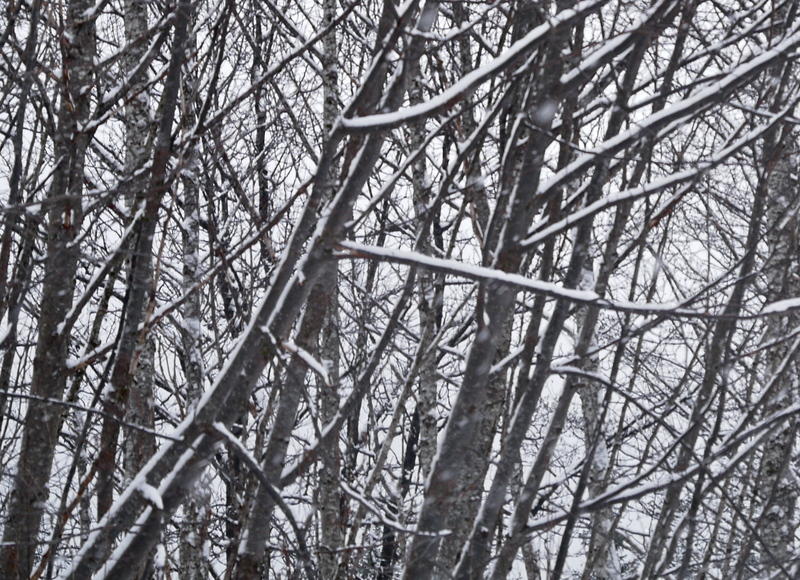 Snow started falling on Chicken Ridge last night, turning our rain washed yard white. New snow is a beautiful thing until you decide to shovel it, when it becomes a burden, its fellow flakes on unshoveled sidewalks a hinderance. 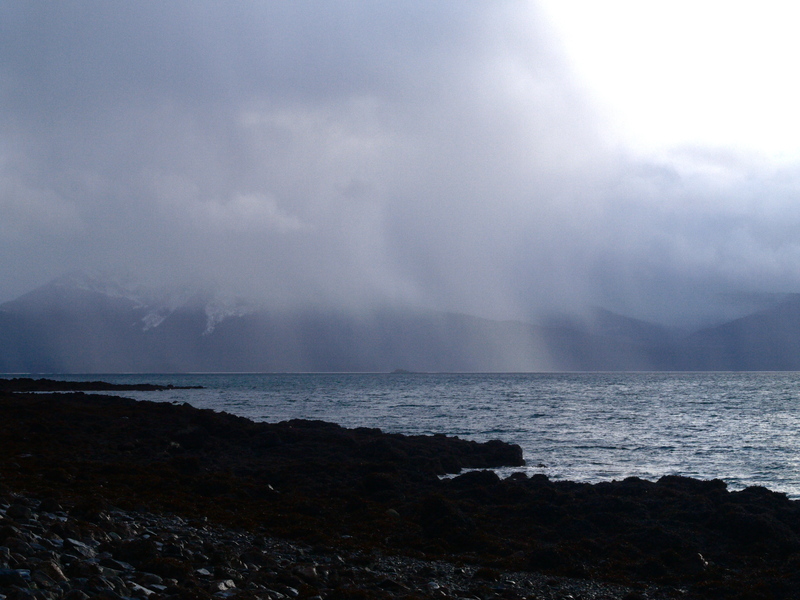 This entry was posted in Aki, Dan Branch, Juneau, Nature, Southeast Alaska on November 30, 2013 by Dan Branch. In hope of finding snowfall rather than the heavy rain plaguing Chicken Ridge this morning, I hauled Aki out to the glacial moraine. Rain followed us there. In a minute Aki lost her initial exurburance for the adventure, stopping me 50 meters from the car with a questioning look. Raising one front paw out from the rain sluiced trail ice, she stopped to offer an excuse for returning to the house. Believing that beauty and the happiness it brings can be found even in hypothermic weather, I pressed on. Loyal friend that she is, the little dog followed with tail down until we met a happy Labrador retriever who had not lost his exurburance. After that, pride and interesting scents kept up her spirits. While the rain lessened the effectiveness of my gloves, I read a government sign that asked us not to attack the beaver dams currently flooding out access to half the moraine. A group of trained volunteers were controlling the flooding by notching the dams. 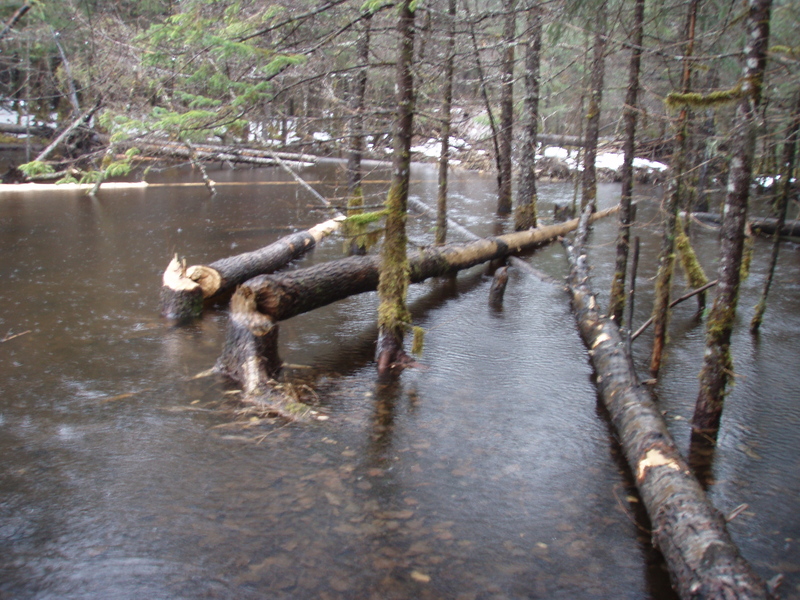 This reduced the flooding while keeping the water levels high enough to protect the silver salmon spawn. According the sign, and I have no reason to doubt its words, the beavers’s work helps the salmon which feed trout, eagles, and bears. Have I misjudged the industrious rodents. Maybe yes, maybe no. The problem is that the little guys dam salmon streams and watercourses that have never seen a silver salmon. Water backing up from one of the later efforts is currently flooding out my favorite access trail to moraine. 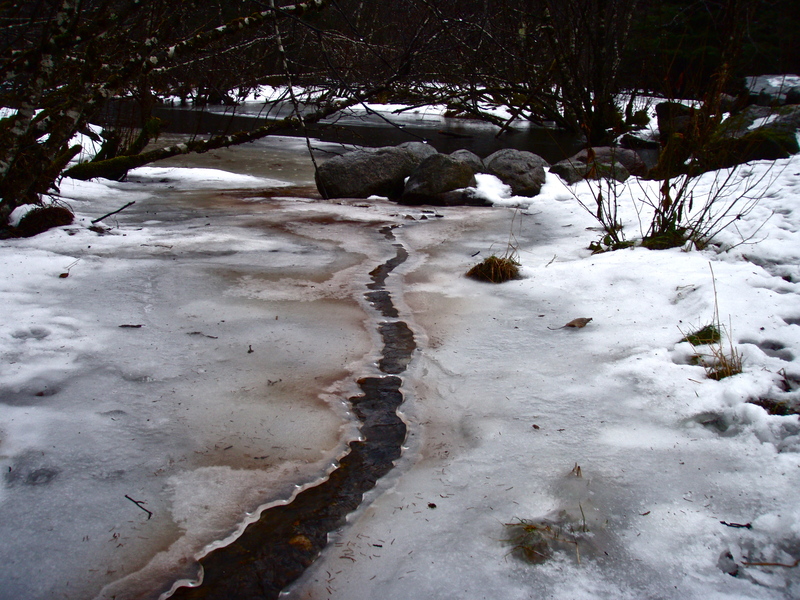 This entry was posted in Aki, Beavers, Dan Branch, Juneau, Nature, Southeast Alaska on November 29, 2013 by Dan Branch. This view should always have whales. I’ve seen them here, running on the Admiralty Island side of Stephens’ Passage; their inverted cones hanging in the air as each humpback’ head dips under the water. Today, with most of our whales heading toward Maui, we only see three ducks taking flight from the water. Unsettled weather provides the real drama on the beach. To the south, columns of rain drop from the obscuring marine layer straight to the passage waters. The clouds part to the west, revealing blue skies and a soon to be setting sun. Aki barks and runs to the tree line where some recent deer tracks lead. 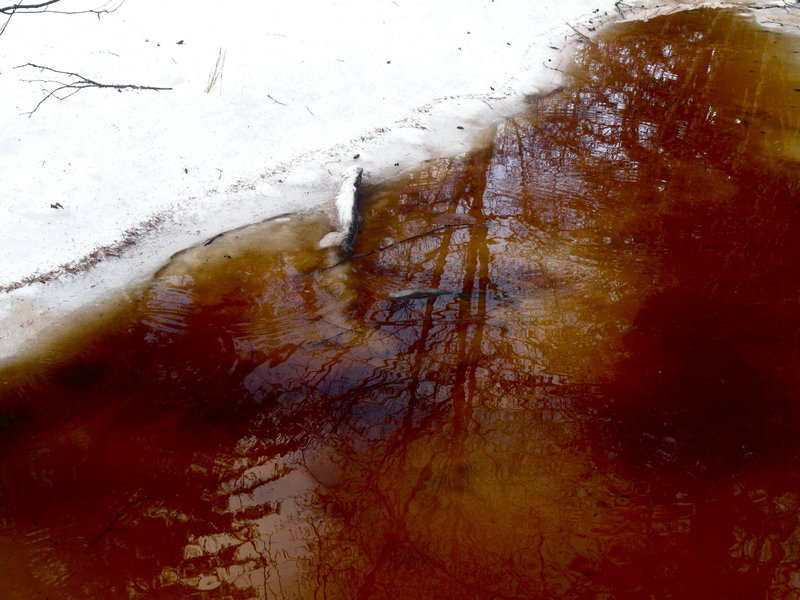 We started this walk in a thick alder forest drained by winding stream filled with muskeg brown water. Clear panels of 2 inch thick ice, straight edges sharp enough to have been cut with a knife, lay against the stream edges, secured there by back eddies. Armed with a camera, I hunted beauty; Aki the urine stories of forest animals. Away from the trail, tracks in the snow, wolf and a human hunter, crisscrossed those of a large deer. Wolves don’t honor our hunting regulations but the deer’s other predators must stop hunting after the first of the year. I’ll look for the deer’s tracks in January. 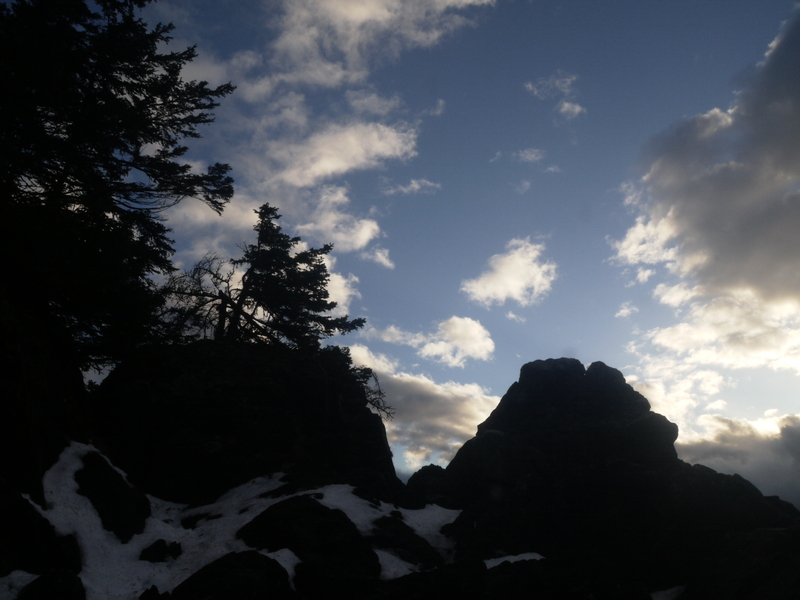 This entry was posted in Aki, Dan Branch, Juneau, Nature, Southeast Alaska on November 28, 2013 by Dan Branch. I’d forgotten how winter retreats out-the-road during November thaws. Here on Chicken Ridge in Downtown Juneau, rain and warmer temperatures did away with most of the snow days ago. After driving beyond mile 20 Glacier Highway, we found the snow still thick on the ground. I’d should have brought the skis with me to Eagle Beach. Aki and I make do with boots and paws, thanks in part to a trail set by earlier visitors. Less than a mile up the trail, we swing north onto a a snow covered trail tracked only by a wolf, then later a bear then a deer. With a foot of snow covering this wide trail through trees bending under the weight of more white stuff, I have expect to hear carolers instead of the unseen woodpecker hammering his way toward food. Without any evidence of other men, in woods deep enough to serve a Russian tale of trolls, I should have been disconcerted by the fresh wolf tracks. Aki liked to trot over them, happy to let her big cousin break trail through the snow. Since she, all of 9 pounds soaking wet, showed no fear, I didn’t either. When the trail crosses a still running stream, I spot an American dipper bobbing about on a windfall. These tough little guys think nothing of hunting in the winter water. After the stream we find where the wolf left our trail, his tracks replaced by those of a deer crossing into a meadow where fog softened edges of bordering spruce. 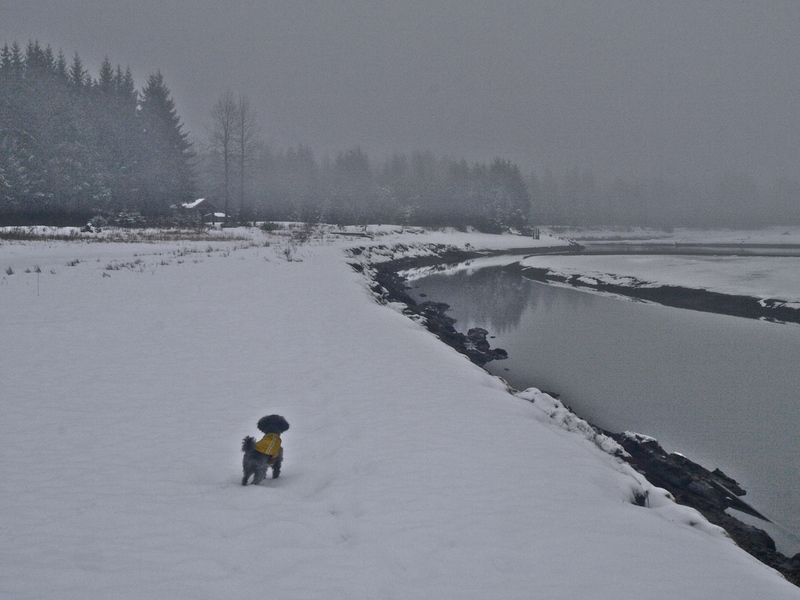 Later we found fog’s grey blanket covering Lynn Canal breakers that rhythmically struck out-shore sandbars. 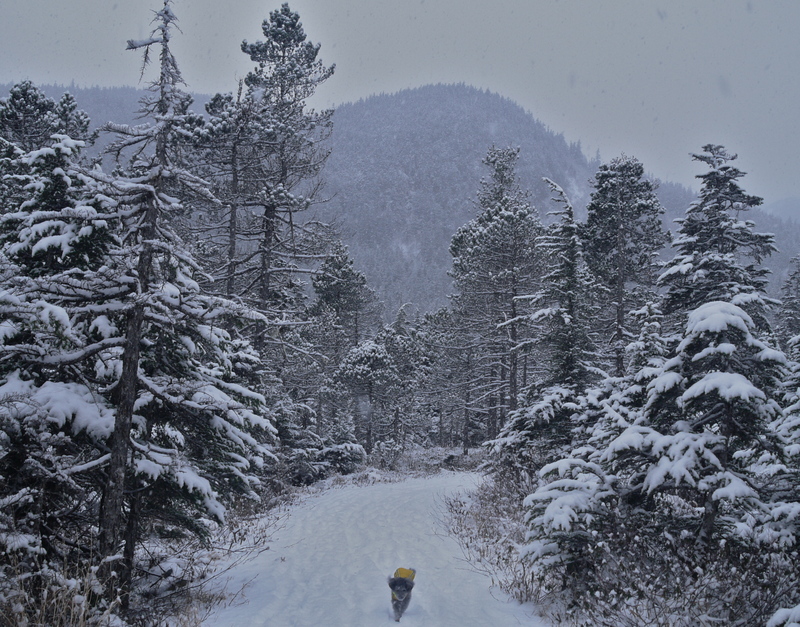 This entry was posted in Aki, Dan Branch, Juneau, Nature, Southeast Alaska on November 26, 2013 by Dan Branch. 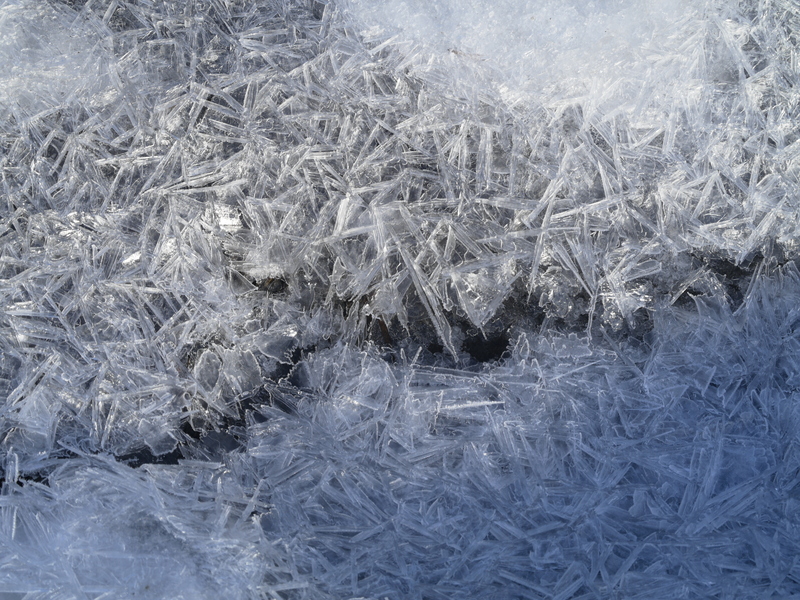 After spending the morning inside looking out at sun shinning on frost, I was anxious to walk in the sunlight. Its source, traveling on a low arc above the mountains of Douglass Island, was about to drop out of view until tomorrow. Dusk had already reached Chicken Ridge and crawled north along Gasteneau Channel as we drove toward the glacier. We reached daylight just before the Walmart turn off, where it flooded the wetlands, then exposed by low tide. Aki shot out of the car and down into tidal zone. 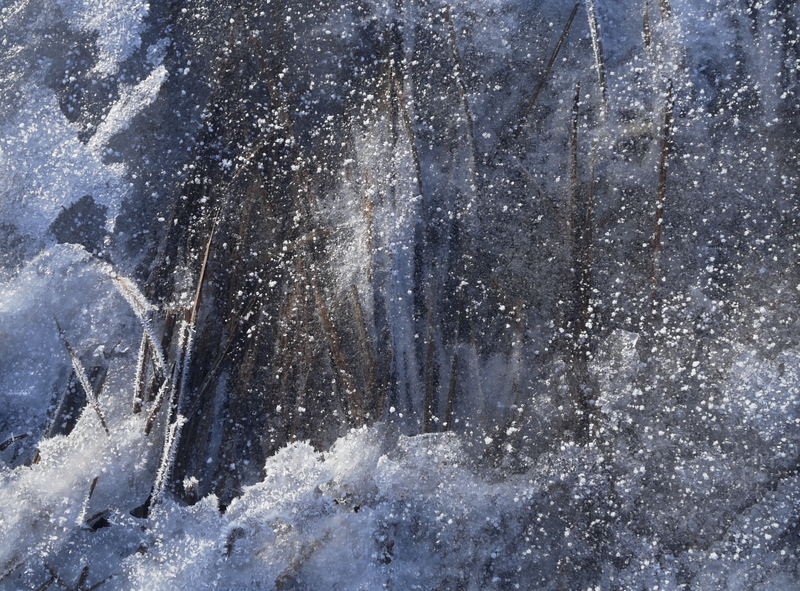 I followed, taking pictures of frost covered grass and ice covered streams—-anything sparkling in the retreating sun. Dusk replaced daylight in ten minutes but the grasslands, now covered with a sheet of refrozen snow, still glowed as if giving back light taken during the short day. 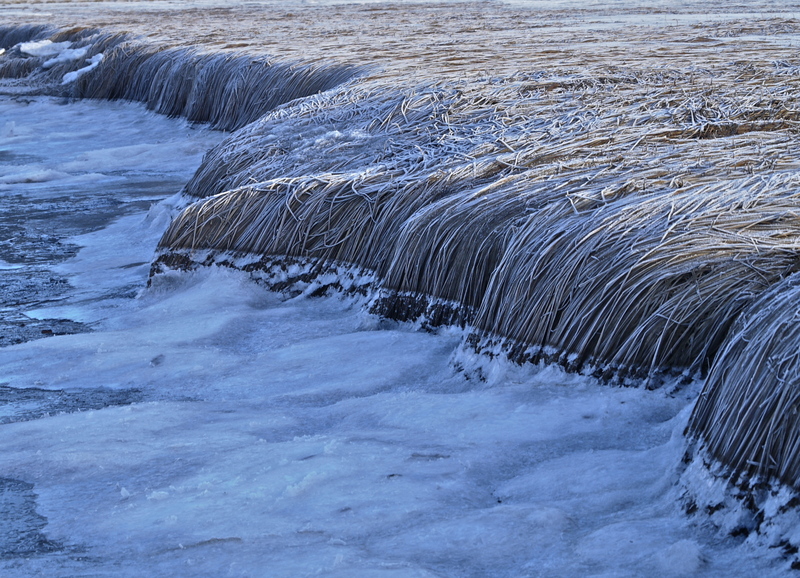 Long blades of grass flowed in and out of the ice. 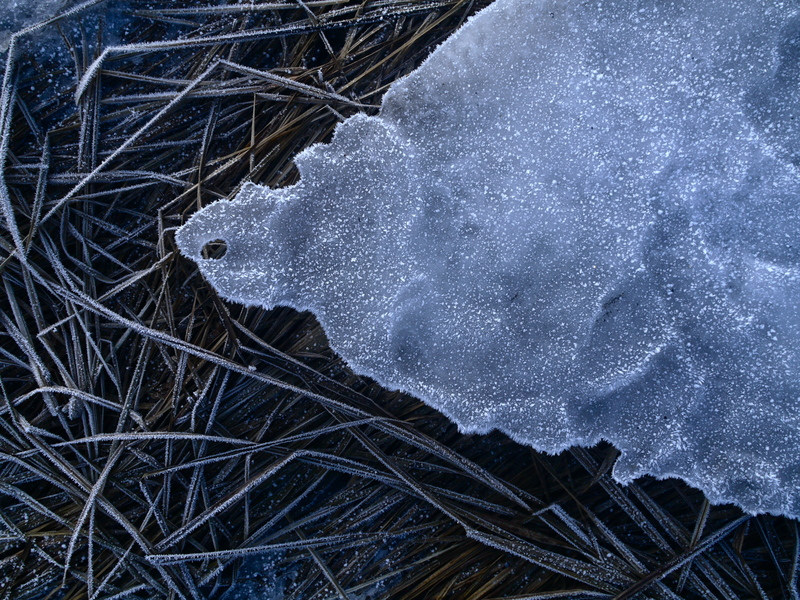 When ice free the grass lay just above the frozen ground in patterns formed by the retreating tide. Aki chased a phantom through still standing grass—springing rather than running like the antelopes on my grandfather’s ranch. 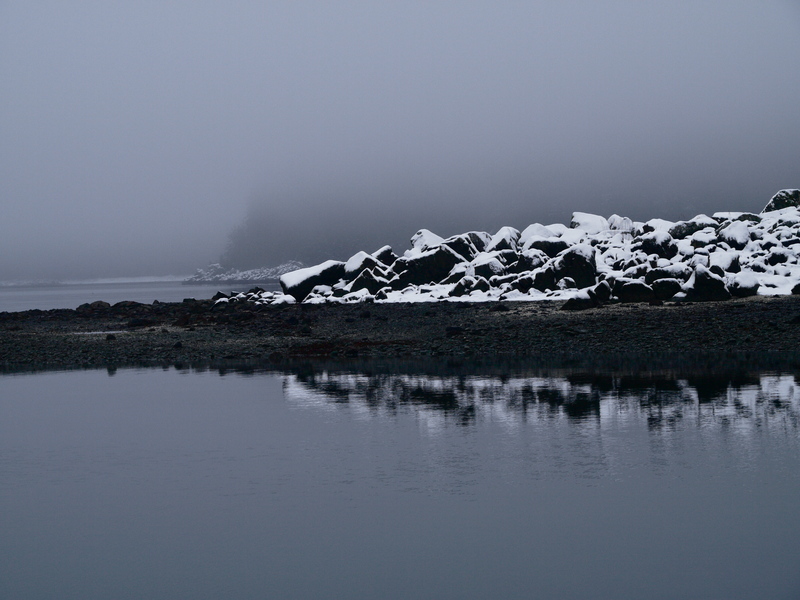 This entry was posted in Aki, Dan Branch, Juneau, Nature, Southeast Alaska on November 24, 2013 by Dan Branch. Sometimes, a winter storm ends in clear, cold but sunny air. Everything sparkles in light. More typical a gray warm front drives off winter. 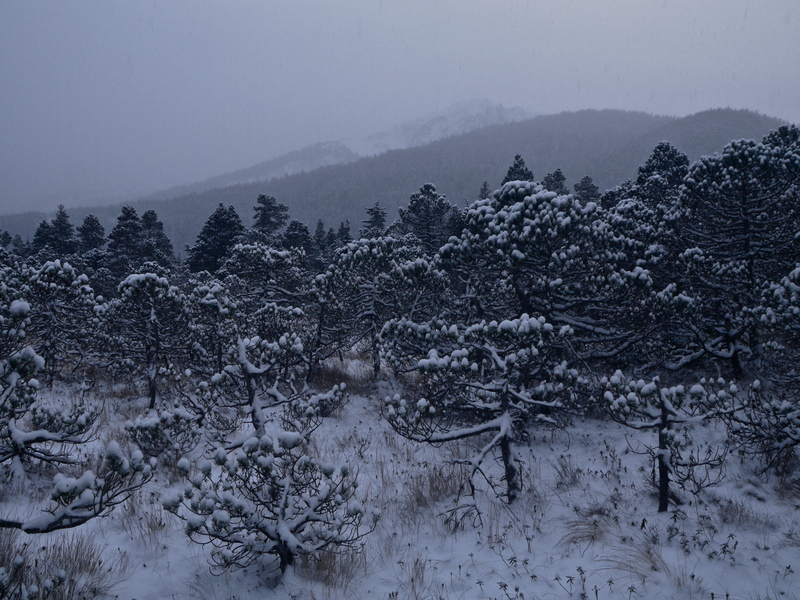 Last night, wind driven rain ended the first snow storm. 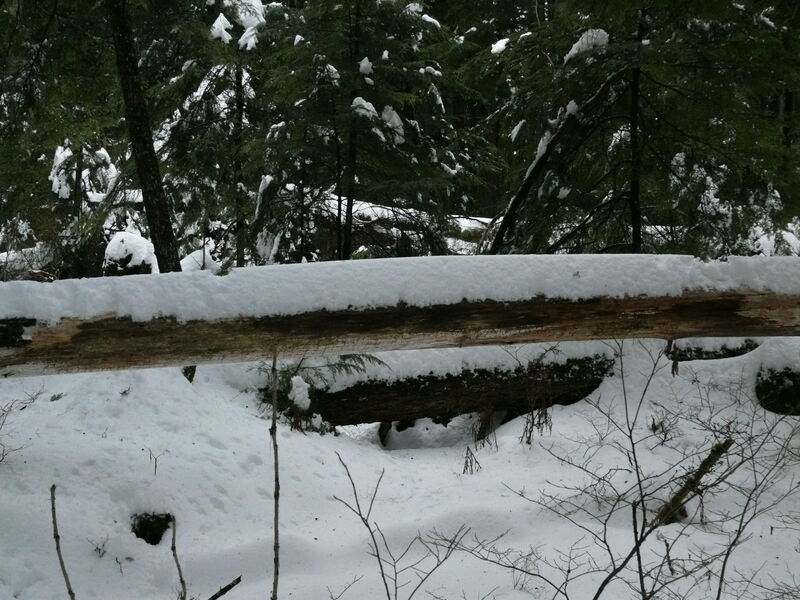 The storm left behind more than a foot of snow in the woods. With the wind and rain still shrinking the snow pack on Chicken Ridge, the little dog and I headed to the shelter of the old growth. We should have chosen open ground. The rain from clouds stopped but wind and warming temperatures created a storm of falling water droplets inside the woods. 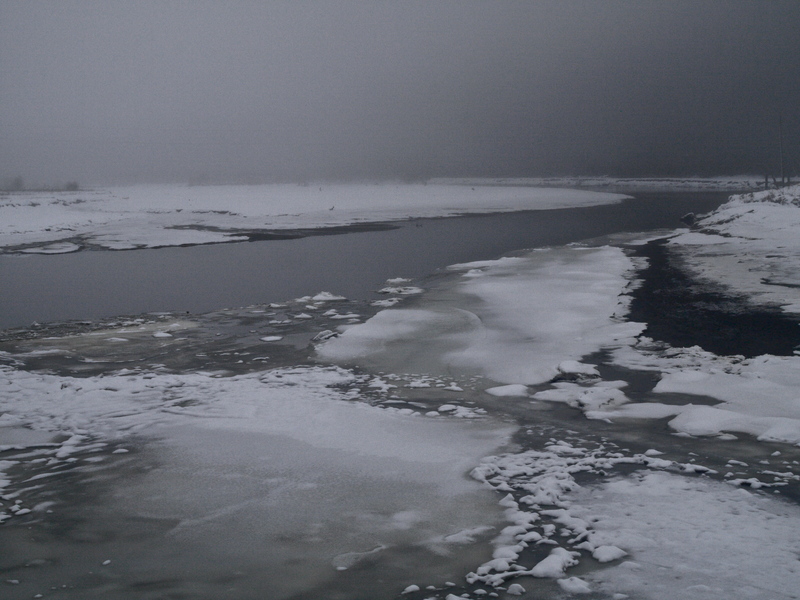 The heavy snowpack soaked up each drop, softening as it did. I post holed down the trail as my boot socks absorbed melting snow. Aki, never the fool, let me brake trail. 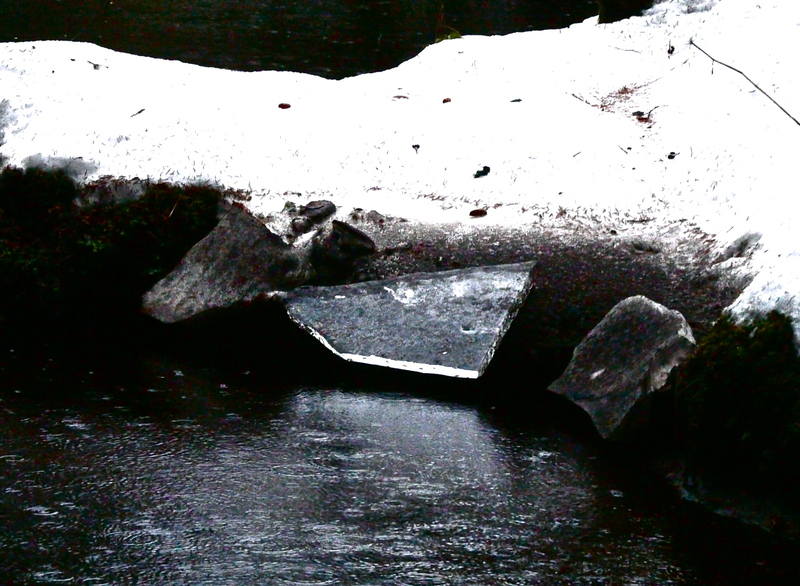 We had to cross an even deeper snow field to move from forest to beach recently bared by the receding tide. Our presence didn’t bother a loose collection of gulls relaxing among some small beachside boulders. 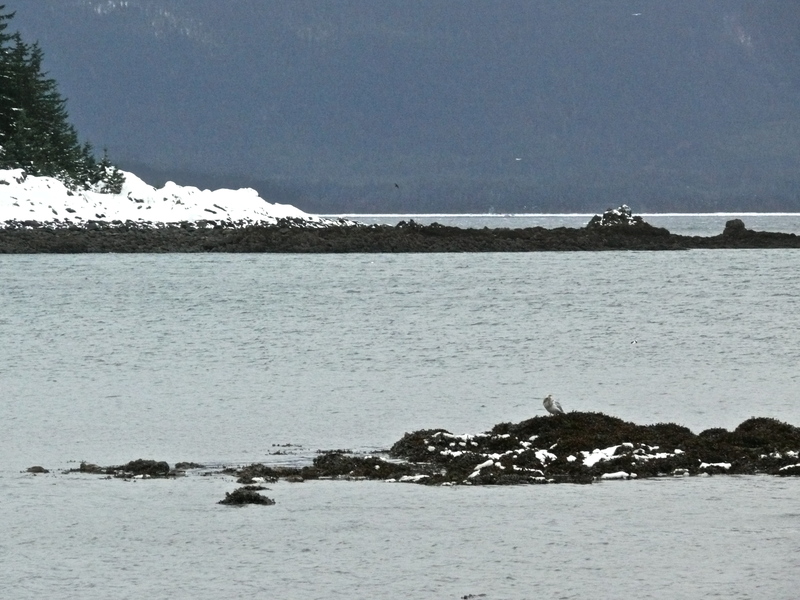 One stood tall and alone on an offshore outcropping. I mused about gull behavior, always wanting to credit them with knowledge and organization skills they can not have. Later, a picture I took of the offshore guard showed it with a beak full of fish. A raft of barrow’s golden eye floated near the beach along with one red-breasted merganser who might have hired as body guard for the smaller ducks. 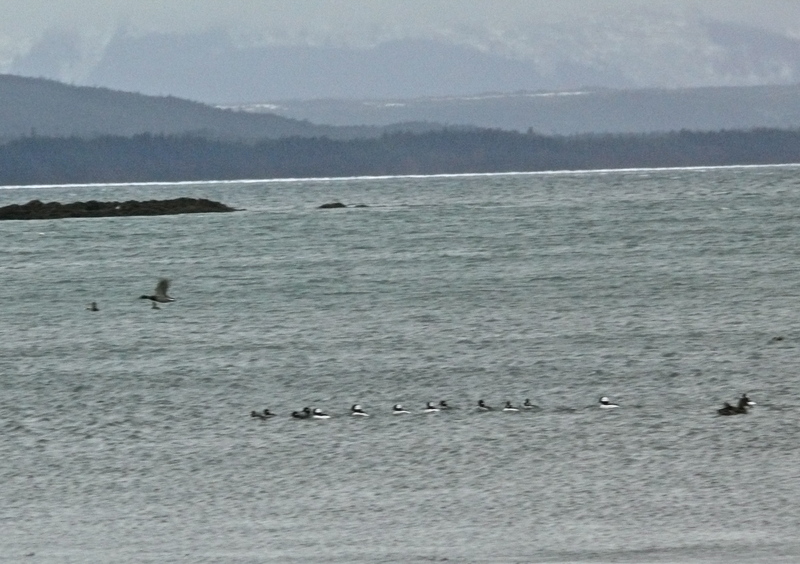 At the mouth of Peterson Creek the recently empty small bay was lousy with buffleheads and harlequins, scoters and mallards—all returned to their winter feeding grounds. 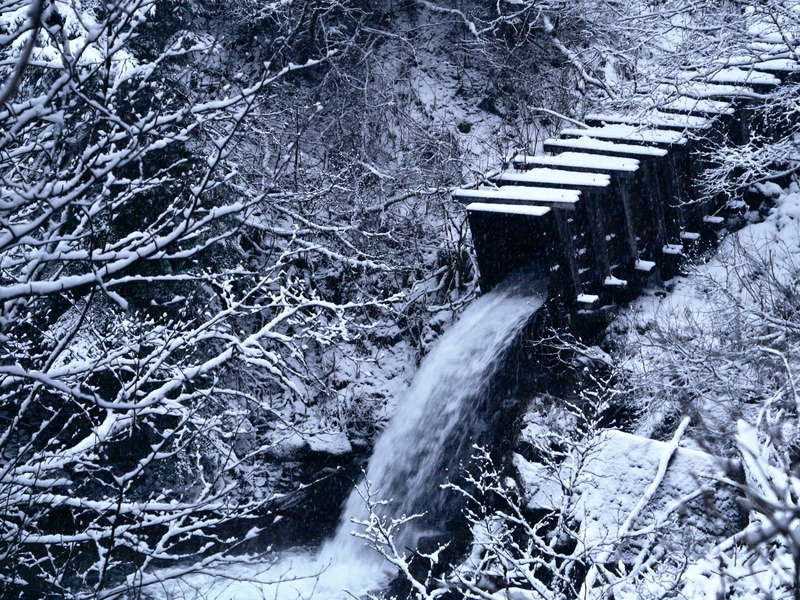 This entry was posted in Aki, Dan Branch, Juneau, Nature, Southeast Alaska on November 22, 2013 by Dan Branch. I brought Aki on this trail because it leads to a freshly frozen mountain meadow. On the way we passed thickets of middle aged alders, now wearing a layer of snow, not the leafy covering of our last visit. Their barely covered trunks arc and limbs bend gently upward. I know the curving tension comes from each tree’s hunger for sun. I know it is wrong to create fantasy lives for these trail side alders but they look too much like a ballet troop getting in a couple hours of barre work before lunch. I can almost hear Sibelius over the grunts of a fork lift unloading barges across channel. Aki stays well ahead on this trail, showing impatience each time she must wait for me to catch up. 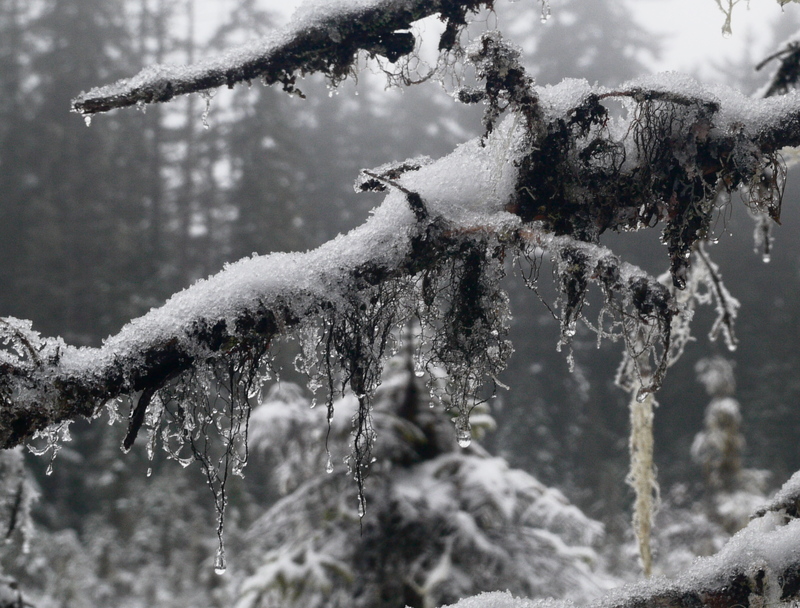 With the temperature around 14 degrees Fahrenheit, today’s rain forest snow falls dryly on the trail. 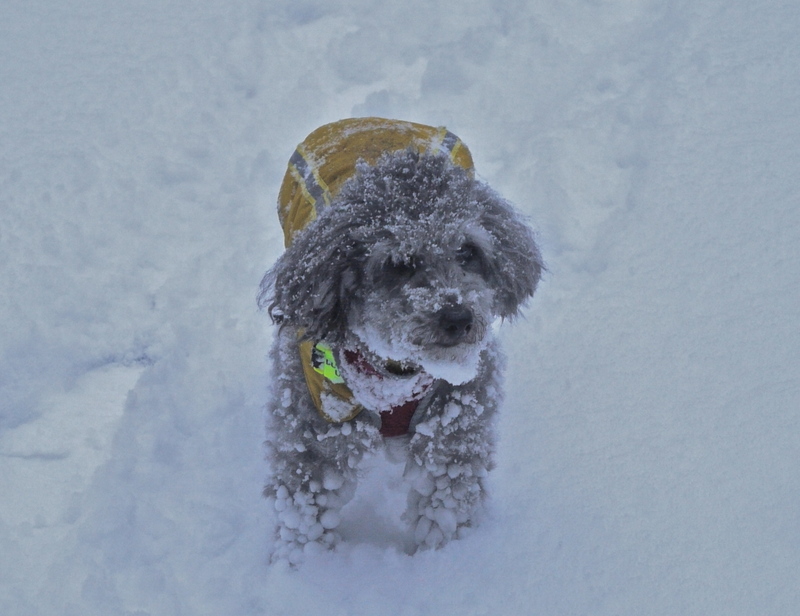 It doesn’t stick or form pesky snowballs on Aki’s poodle coat. 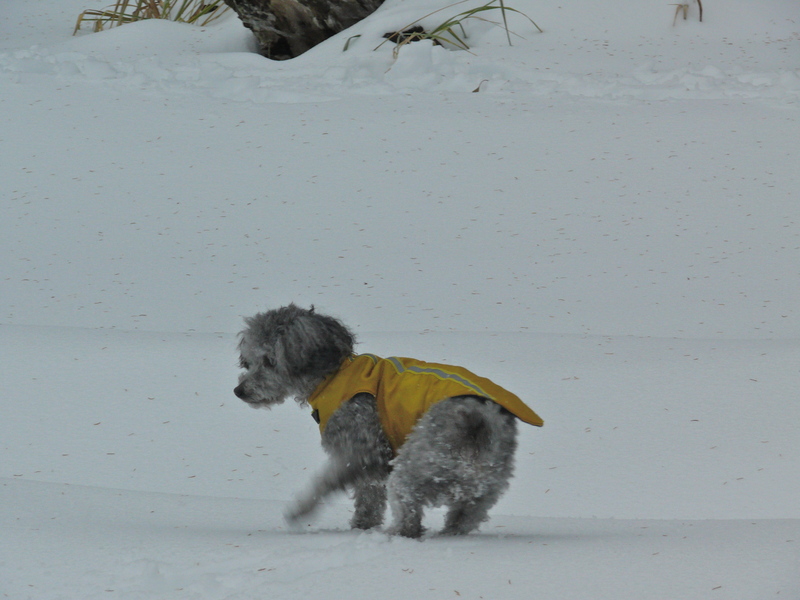 With only a few inches fallen, the snow can’t impede her flight across the meadow. 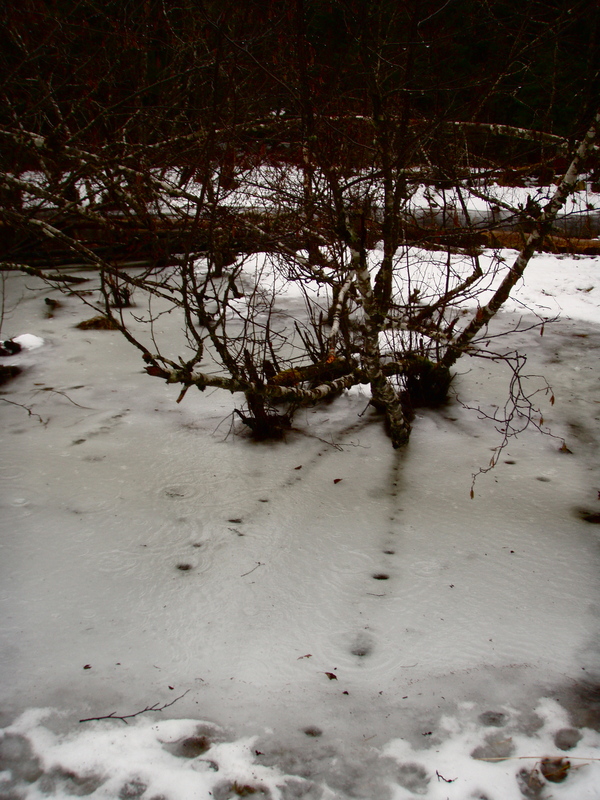 Since the near zero temperatures of the past two days had solidly frozen the muskeg, we leave the main trail. With our combined memories of last year’s paths, we manage to avoid getting lost. Sometimes I lead Aki away from confusion in a thicket of stunted pines. Most of the time she saves me from leading us away from the way home. 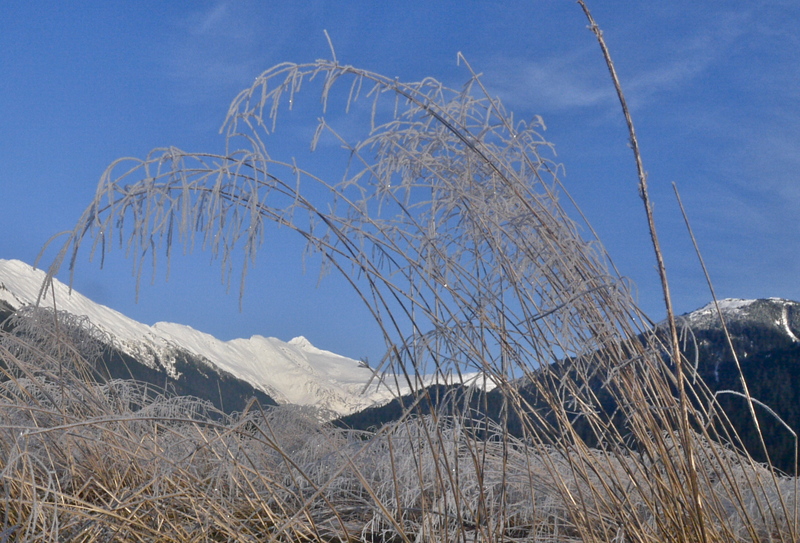 This entry was posted in Aki, Dan Branch, Juneau, Nature, Southeast Alaska on November 20, 2013 by Dan Branch.